Back in high school chemistry, we learned about pH: acids had low numbers, alkalines had high numbers, and a pH of 7.0 was neutral. And it all meant absolutely nothing in terms of day-to-day life. It now turns out that we have a better shot at long-term health if our body's pH is neutral or slightly alkaline. When we tilt toward greater acidity, which can be measured easily, we have a greater risk of developing osteoporosis, weak muscles, heart disease, diabetes, kidney disease, and a host of other health problems. The solution, according to scientists who have researched "chronic low-grade metabolic acidosis," is eating a diet that yields more alkaline and less acid. Just what kind of diet is that? One that's high in fruits and vegetables. That might not seem like a big surprise, except for a few unexpected twists and turns. If the idea of balancing acid and alkaline foods seems a bit off the wall, it does have a somewhat checkered past. Most people, including physicians, aren't familiar with the dangers of acidosis, except in the most extreme situations. Those include lactic acidosis, from overexercise; ketoacidosis, when diabetes start burning their own fat; and renal acidosis, which can be a sign of kidney failure. The original scientific research on acid-yielding and alkaline-yielding foods dates back to 1914 and was remarkably accurate, according to Loren Cordain, Ph.D., a professor and researcher in the department of health and exercise science at Colorado State University, Fort Collins. Then, in the 1930s and 1940s, the acid-alkaline concept was hijacked by early health food "nuts." Among them, William Hay, M.D., proposed an almost ritualistic eating habit based on food acidity or alkalinity. Since then, most doctors have viewed any discussion of acid and alkaline diets with a skeptical eye. But the problem with acid-producing eating habits is very real, contends Cordain, a leading expert on the Paleolithic, or Stone Age diet. 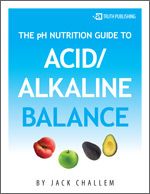 "After digestion, all foods report to the kidneys as being either acidic or alkaline," he says. "The kidneys are responsible for fluid balance and maintaining a relatively neutral pH in the body." That's where things get interesting. When acid-yielding foods lower the body's pH, the kidneys coordinate efforts to buffer that acidity. Bones release calcium and magnesium to reestablish alkalinity, and muscles are broken down to produce ammonia, which is strongly alkaline. By the time the response is all over, your bone minerals and broken down muscle get excreted in urine. Long term, excess acidity leads to thinner bones and lower muscle mass, points out Anthony Sebastian, M.D., of the University of California, San Francisco. These problems are compounded by normal aging, which increases acidosis, bone loss, and muscle wasting. Along the way, calcium and magnesium losses can equate to deficiencies, with many ramifications. Both minerals play essential roles in bone formation and normal heart rhythm. Low magnesium levels can cause muscle cramps, arrhythmias, and anxiety.